French company ABB in Lyon has selected polybutylene terephthalate (PBT) Ultradur® B4450 G5 from BASF for its DC contactors for use on railways. Contactors used on railways must satisfy the stringent fire prevention requirements of the French Railway Standard NF F 16-101.The 25% glass fibre-reinforced thermoplastic is based on a special flame retardant system and, with its especially good values for smoke density and toxicity, satisfies the requirements for the I3F2 classification in this standard. This material has found one of its first production applications at ABB. It is available in light colours and exhibits good processability and mechanical properties. A special property of the material is that installed metal contacts display only minimal corrosion even in warm environment with high humidity. As a result, electrical components that come into contact with this plastic benefit in terms of reliability and appearance. With regard to electrical properties, the material has a CTI value of 600. This means that Ultradur B4450 G5 exhibits a tracking resistance, or insulating ability, that is exceptionally good for PBT compounds and in turn provides a great deal of freedom, especially regarding component miniaturisation. The laser contrast of Ultradur® B4450 G5 is also good in the case of light colours and makes it possible to incorporate engraved identification such as data matrix codes that can be read with a scanner. 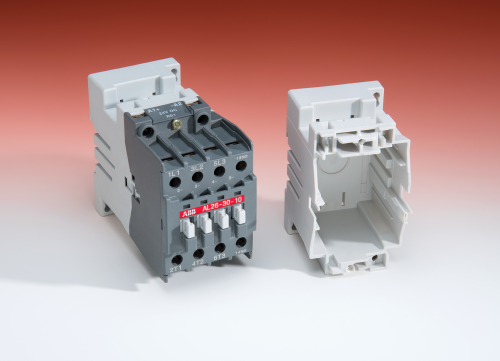 In addition to contactors, the flame-retardant material is suitable for use in other current-carrying electrical components where dimensional stability is critical, for instance, in micro circuit breakers used in photovoltaic systems, power electronics housings or coil bodies.